Arcada's Ceti Hasselman was responsible for coordinating the interior design project. The project team also included Maria von Hertzen, Anki Åvall, Gunilla Sjöberg, Leenamari Kaivaara and Tytti Nevalainen. The new spaces were completed in the summer of 2018 and have work stations for about 100 students. Arcada is a modern, international vocational university that educates students in various industries to meet industry needs. The university takes an active employer role and encourages their employees to participate in societal debate and to think innovatively. In a workplace that strives for sustainability, you need to be able to see things from different perspectives. "The goal was to increase satisfaction and to create functional workplaces that encourage student creativity. I'm very pleased with the remodelled areas. The remodelling has succeeded in supporting our activity-based school concept." The Fields high-backed easy chairs in the library make up a pleasant reading corner next to the window. The popular meeting place is found right near the entryway. The high-backed Fields sofa makes it easy to make a room within a room. At Arcada, the work spaces, meeting spaces and library were the main focus of the renovation. And students were welcome from day one to give their opinions and ideas. Quite a few wishes came out of the student workshops: they asked for more collaboration and concentration spaces. And, they asked for functional meeting places that encourage movement. They wanted to get rid of the old, uncomfortable sofas but wanted to keep some of the existing furniture and combine it with new furnishings for an up-to-date look. One example is the yellow tables that were saved but covered with black tape to fit in with the new style. This helped us stay on budget and to think environmentally. The roomy chat square contains many places for relaxed socialising and studies. Following the request of the students, a stimulating accent colour was chosen to create bold contrasts in the area. 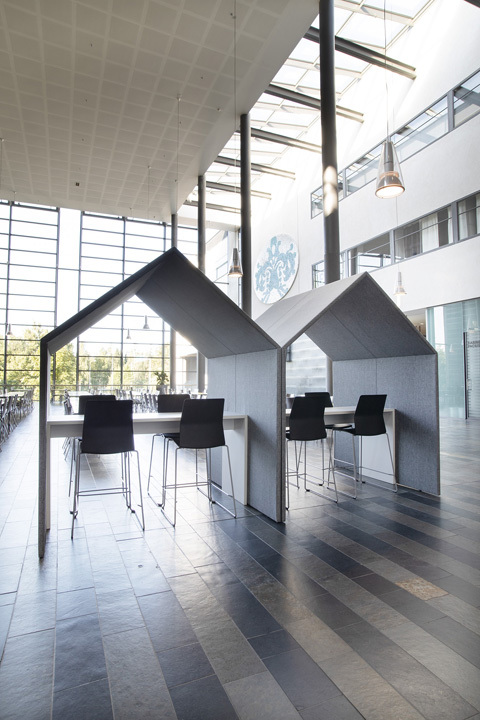 The small sound-absorbing huts offer spaces for group work and the Fields easy chairs encourage creativity and discussion. The handy glass writing board functions as a whiteboard and is magnetic. The Leia chairs on runners are easily stacked and can be put away when not needed. And it is now easier to work high-tech as there are integrated charging stations for computers, phones and tablets. 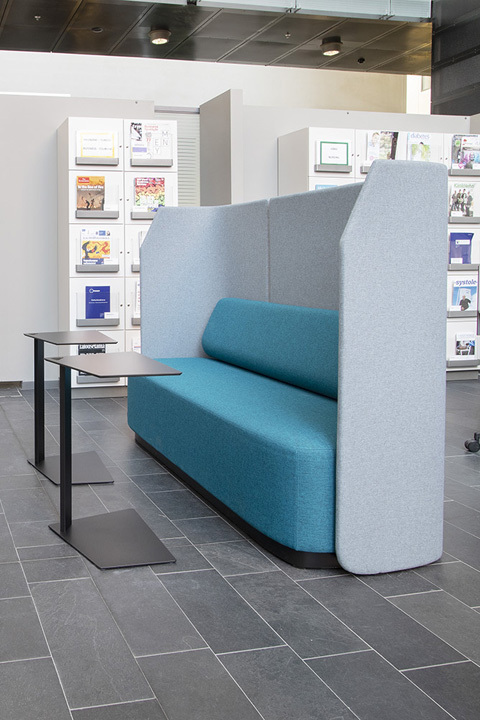 The high-backed Fields section seating provides readers with peace and quiet. The large window boasts a nice view of the green courtyard and the swivel frame of the chair makes it possible to occasionally rest the eye on the landscape. Fields Love Seat is an easy chair for two with a back on each side of the seat. The small, mobile tables offer convenient places on which to put your coffee cup or book. The library also holds workplaces for concentration that also allow for activity through the possibility to work sitting or standing. The goal was to create functional, pleasant spaces that encourage student collaboration. There was also a target to increase the spaces' utilisation rate. 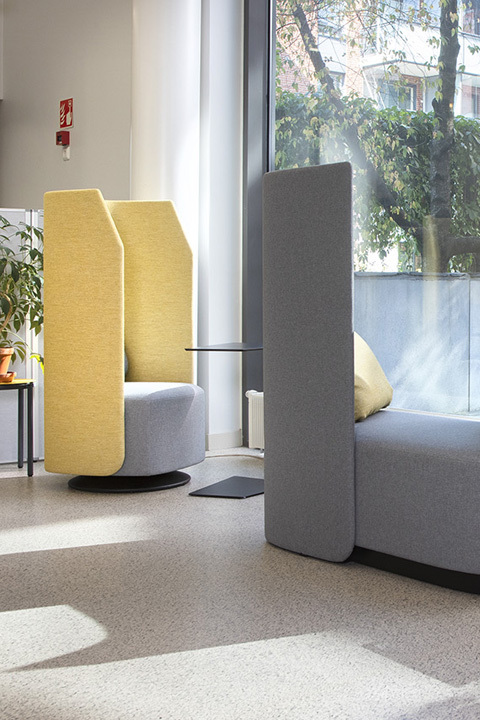 The selected interior design solution promotes active work, improves ergonomics and offers students quiet places for concentration and meeting places for socialising. The freedom to choose a suitable place to work increases satisfaction.